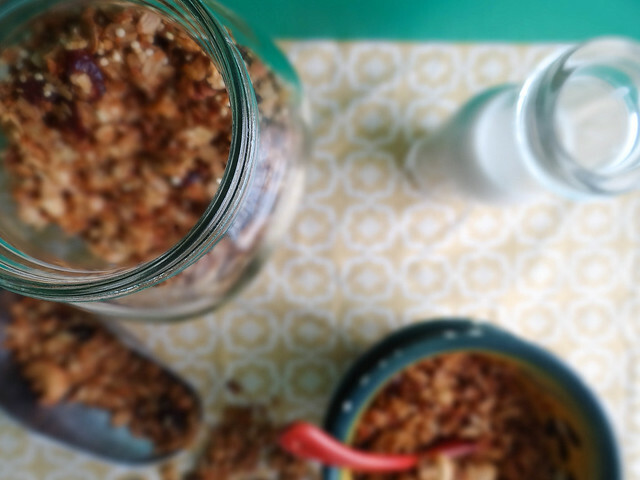 I had forgotten how insanely easy and tasty homemade granola is. 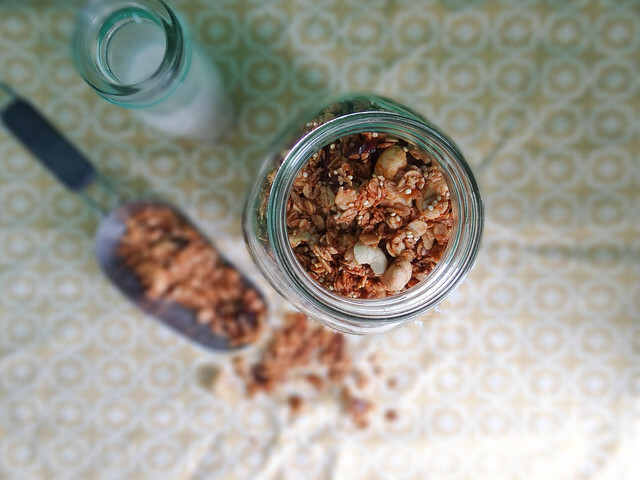 A post by Somer at Vedged Out inspired me to add quinoa to this batch of granola and let me tell you I loved the added texture! In order to try and get my grocery budget on track for 2013 I have decided to experiment with a $50 a week budget for the month of January. My game plan is to create a weekly menu, batch cook on Sundays, loads of bread making and my crock pot is going to get a pretty good workout this month. On paper and in my head this master plan of mine sounds pretty good, but what happens & why my non existent food budget is out of control are all the pretty and tasty foodie goodies I am lured to every time I hit up our local natural food store - teas, baking items, super foods, kombucha; they are my crack. Believe me, I make a list and take it with me, I tell myself I only need what is on the list but then I find myself leaving with a lot more than what I had come for. So, to try and combat that urge to throw in anything and everything into my basket that appeals to me I am going to try and practice less is more. I have also set a goal to save up a bit of money for a trip Justin and I are taking in March - written lists & goals work for me. I will keep you posted as to how this goal of mine pans out with a couple of planned posts. Do any of you suffer from overspending at your favorite food stores & specialty shops? Food Budgets - have any tips and tricks as to how you stick to yours, do you even have a food budget? in a mini food processor, combine persimmon & maple syrup until persimmon is liquefied/pureed. in a small sauce pan, combine persimmon mixture and coconut oil cook over medium heat until coconut oil has melted. in a large mixing bowl, combine all remaining ingredients (oats through salt), stir the wet into the dry until the dry mixture is well coated with the wet. 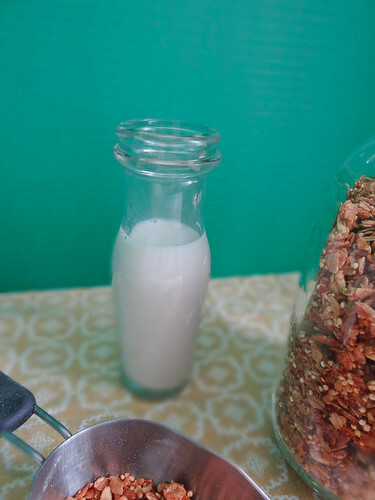 Line a rimmed baking sheet with parchment paper, evenly spread the granola mixture onto the baking sheet. Bake until in a pre heated oven for 30 minutes, halfway through baking (at the 15 minute mark) stir up the granola to prevent over browning. 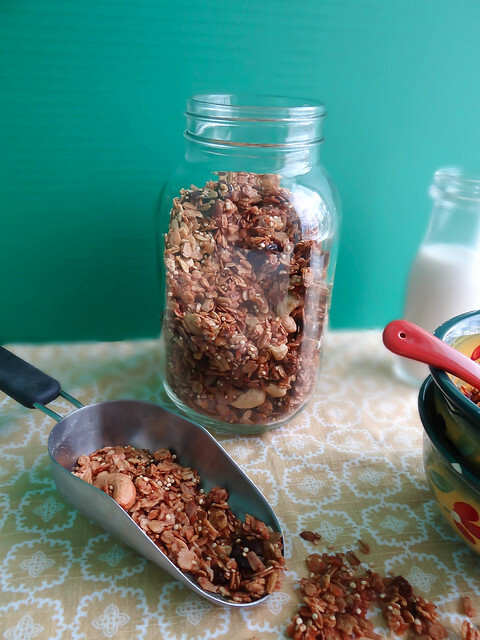 Remove from oven - using the back of a spatula firmly press the granola down into the pan. 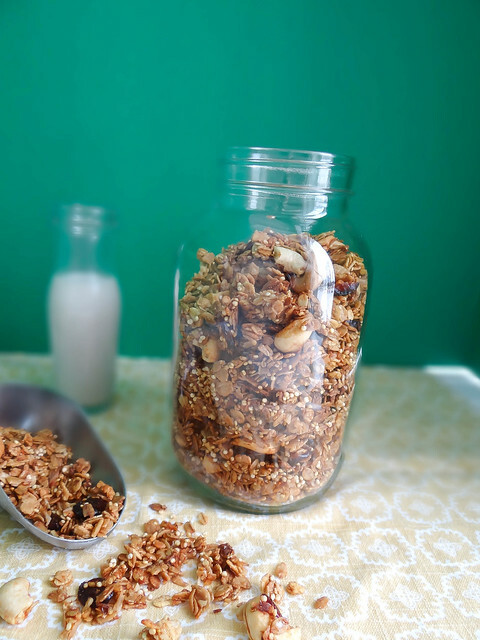 Allow granola to fully cool on the pan - once cooled transfer to an airtight container and enjoy throughout the week! This granola looks delicious! I'm not a fan of persimmons on their own, but I feel like this is a way I could get on board with! here's to a new thrifty new year!! 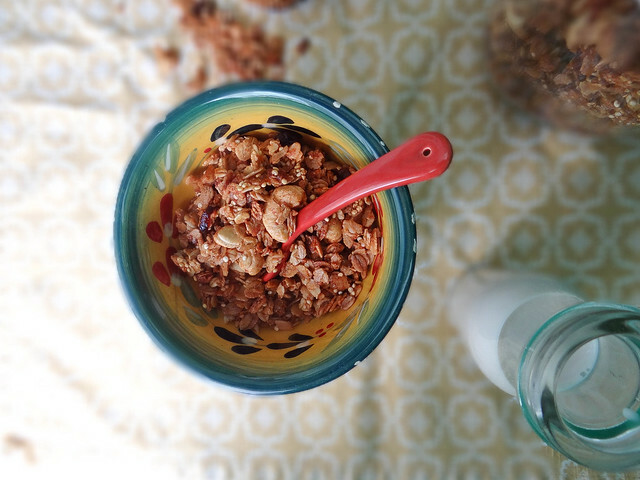 and to delicious persimmon granola! Caitlin, I'm with you, I spent nearly $100 on produce 2 days ago.... That didn't even include my other groceries! Oh Heather, good luck! That's a very worthy goal and I hope you can get all the savings you need for your special trip. I can't feed a family of four on that budget. I do overspend sometimes, but it's worth it to me to have ALL the good stuff. 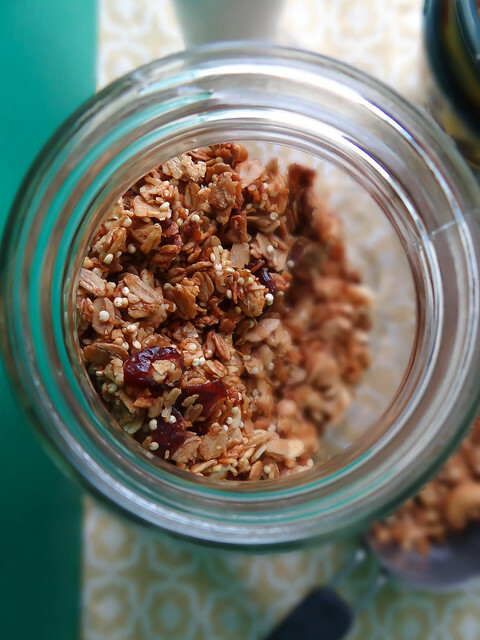 Thanks for the granola shout out, isn't quinoa great in granola! With persimmons it's over the TOP! 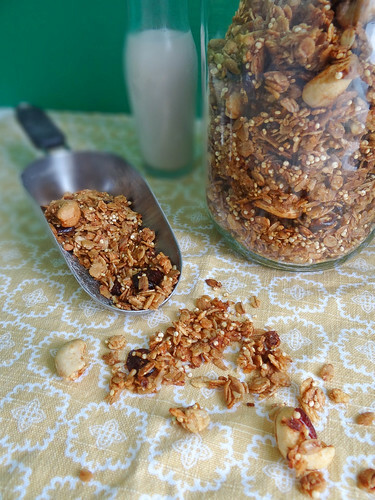 Never would have thought to put parsimmons in granola, but now that I see it done it sounds so good! I'm the same way right after the holidays, trying to be a little more frugal with my budget... lots of rice and beans and what-not. I also get the winter blahs, though, and reach out for out-of-season fruits and veggies which are usually pretty pricey. Oops! I've never been good about sticking to a food budget, and because I care about buying local and often organic, the stuff I get isn't always as cheap as it could (or should... ahem, whole foods) be. I do try to by some things (pre-packaged items that are the same no matter where I get them) from cheaper stores, but I can't say I'm good at managing the money I sink into food. I'm lucky to have a little extra to spend on something like quality ingredients, and since The Fiance and I both care about having good food, I try not to question it too much. It would be a serious challenge for me to go on 50 bucks a month, but I might just have to try it sometime! I know your food budget pain! I'm so good about reigning in my spending in other areas of my life, but at the grocery store, watch out. I'm always so tempted by gorgeous produce or products I've read about on my favorite blogs. Eating a plant based diet can be very inexpensive, but once you start adding in costly specialty ingredients, it quickly adds up! 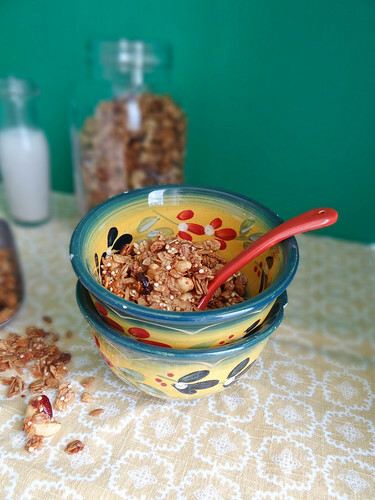 The granola sounds wonderful! Persimmons are one of my favorite fruits, and I can imagine them being fabulous here. What a goal! Thom and I tried that once, but wound up hitting closer to $75 - and I can't say I enjoyed it much. But! We included home goods (toilet paper, cleaning supplies, etc.) in our grocery budget, so if you're just covering food, $50 will be doable! Luck to you, lady! And I love the persimmon granola. I've been trying to get my hands on a few persimmons for a coffee cake. This is so exactly what I'm thinking about and writing about right now - how to be thrifty but still eat well! It's nice to know I'm not alone. I am teaching my teenage sons how to cook, and we are focusing on beans right now, and we also made granola yesterday. It turned out nice, but this recipe looks lovely and I'm excited to add it to my repertoire. 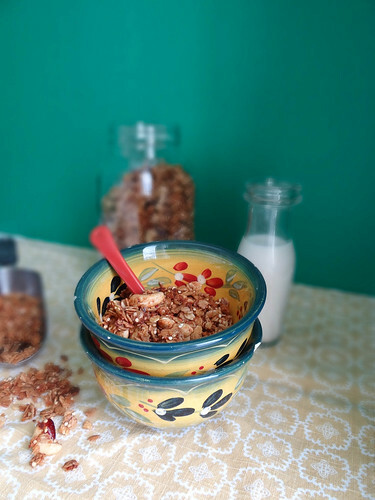 This granola sounds absolutely perfect, because you know how much I love persimmons! I can't wait to hear how your budget works out for you this month! With pre-teen twins, our weekly food budget is quite a bit higher than $50 (and we only have them on the weekends!). I am also easily lured into buying fancy stuff at Whole Foods if I'm not careful. Thank goodness my weakness is on healthy/gourmet specialty foods rather than on clothes or shoes or what-not!